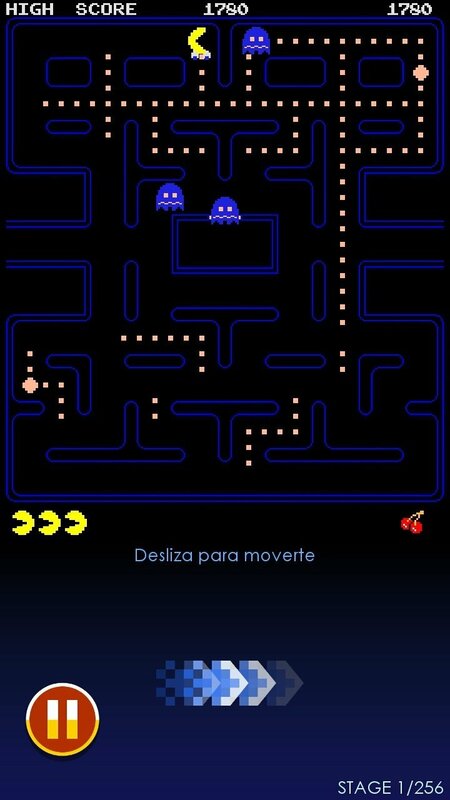 This new PAC-MAN app offers us the classic game mode that, as usual, is all about eating up the pac-dots that appear on our screen, whilst we escape from the ghosts (or to chase the latter if we make the right moves). But it also includes new contents, such as more mazes or a game mode in which we'll take part in tournaments with several levels and the possibility to get hold of special bonuses. It takes the original concept to the next step. Why should I download this Pac-man? Simply because it has been developed by the original company, which is always a sign of guarantee. PacMan 256, World, Championship Edition, PacMan and the Ghostly Adventures… There are dozens of versions of this classic. Faithful recreation of the original version. Add mazes to your collection. Scores and leaderboards to challenge other gamers. Earn extra lives by collecting coins. To be able to play, you only need to adjust the sensitivity of your Android's screen and swipe your finger around. Depending on the direction in which you do so, the main character will move in one direction or another. Don't hesitate to download the application of a game that's a real icon within the world of virtual entertainment and pop culture. It has become a cultural reference that has appeared in loads of different movies, songs, as well as the nickname of famous boxers such as Manny Pacquiao, and the theme of some of Google's most famous pranks within its mapping application. What are you waiting for to start eating pac-dots once again?